Examine the specimens provided. Use the coloring sheets to identify the labeled portion of the skull, the Humerus and the Fibula bones. Learn about the relationship between length of an adult foot and estimated height. Using basic algebra, approximate the height of the people to whom each specimen belonged. Investigate how the anatomy of the hand changes as a person grows. Read more about how skeletal remains are classified in the Carolina Guide to Bone Forensics. 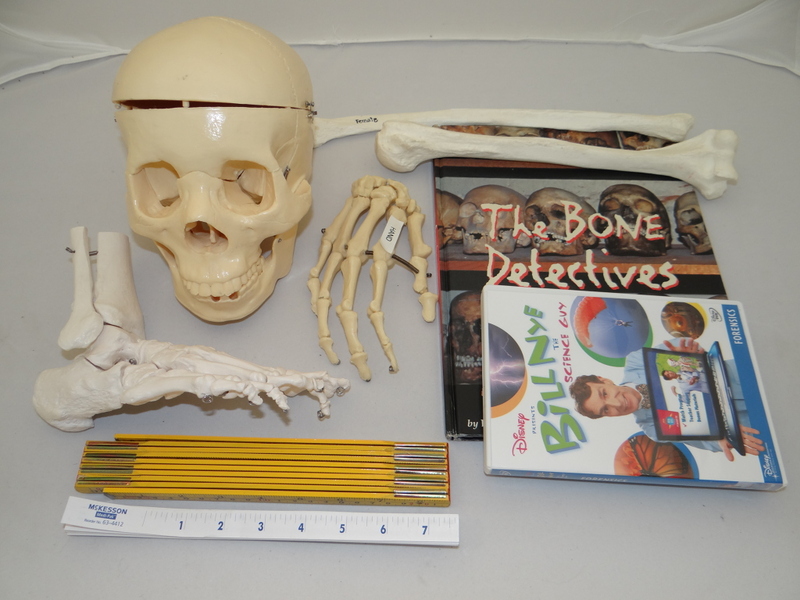 *This kit is a nice complement to our exhibit The Human Skeleton. 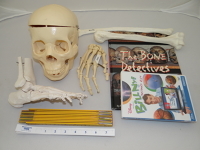 In this kit: Human Skull Replica with accompanying graphic, 1 Humerus with accompanying graphic, 1 Fibula with accompanying graphic, 1 skeletal foot replica, 1 skeletal hand replica, 1 wooden folding ruler, paper measuring tapes, The Bone Detective by Donna Jackson, Forensics (Bill Nye DVD), coloring sheets for skull, upper extremities, lower extremities, and activity guides.